Charles (C.J.) Wilson was born on 12th August 1876, three years before the formation of the National Skating Association of Great Britain. He started skating at the age of 6 in Camden and by the age of 13 had won a "juvenile championship" at Olympia. Skating was in a boom period and in that event alone there were 54 starters, although it is reported that half of them fell at the start! In those days this would have been an unofficial championship with the first not being recognised until 1894, and then it would only be senior titles right up until 1961. In fact, it was Charlie Wilson who won that first British title back in 1894, when skating for Wandsworth he won the event over a mile distance. Back then it was a time trial event, but nontheless, it was Wilson who would be victorious. 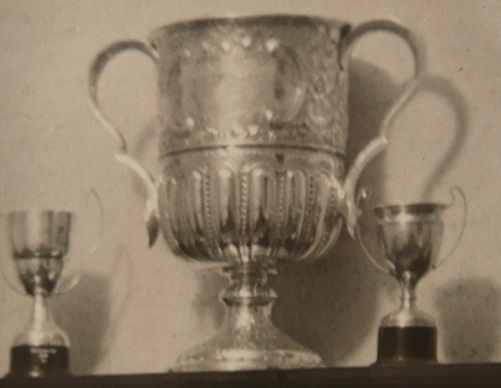 This very first British Championship was for the Benetfink Challenge Cup, which is still raced for today, albeit now the distance competed over is a 1000 metres. After his win there were no NSA events scheduled for another 12 years! Despite this he competed in various speed events sponsored by the Crystal Palace Company - and it is recorded that he never lost a race in all that time. In 1906 the NSA reinstated the British Championship event, this time over one and a half miles. Despite his 12 year absence and now aged 30, Wilson again took the title and retained the Benetfink Cup. By now he was skating for the Willesden club and the track was set out at Crystal Palace. Wilson repeated his success again a year later in 1907 and again in 1908, making a four times on the bounce win. In those days there was a distinct difference between amateur and professional when it came to sport. In 1909 Wilson turned professional and won the 'professional' championship of that year and the following year. By the time he retired from the sport he had not only become the very first 'amateur' British Champion but had also won more than 200 events over distances ranging from a quarter mile to fifty miles. In fact, such was his superiority over all others at that time that throughout his racing career he proudly boasted that he had "never been beaten by a subject of the King". There do not appear to be any photographs of Wilson during his time as an amateur champion, but in a time before World or European Championships this was the only measure one could have of a skaters ability, and Wilson's achievement is one that very few, if any, could match even now, 100 years on.